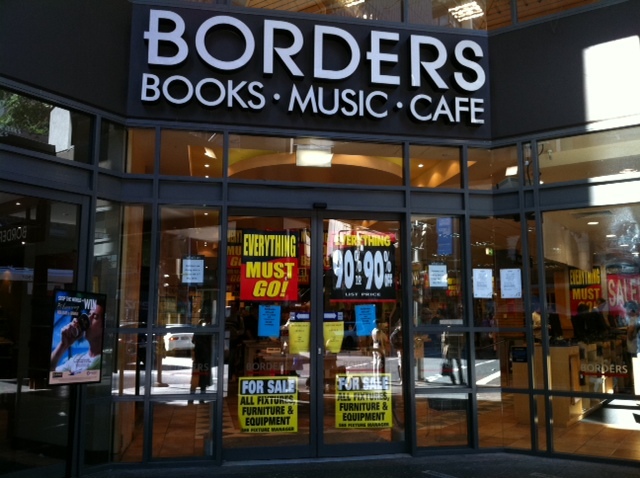 Today, Borders Brisbane City closes its doors for the last time. While some might say “hooray, another giant bites the dust”, it didn’t feel like a party shopping there yesterday. It was like picking over the garage sale of the newly dead. During the day, the shop was packed with people, shoulder to shoulder, looking for something more to buy at 90% off. By last night, three floors of books was reduced to one floor of random leftovers and fixtures and fittings with SOLD stickers. People were in until 9:30pm unscrewing speakers from the ceilings and carting out whatever they could. I acquired some bookshelves. Lovely, lovely bookshelves. Today, everything must go. If you’re in the city, pay your last respects and pick up a bargain. My thoughts go out to the staff. I hate to see the bookshop close down. People buing books on line probably doesn’t help. I really hate seeing any business close down, as it also means there are some that are now out of work, and I feel sorry for everyone concerned. No matter which shopping center I go into, there seems to be at least one or more shops that have shut, things are not looking good. It is bad. Borders had the whiff of desperation a long time before the analysts took notice. First, it started replacing book space with giftwares. Then, it had discount signs up all the time such that consumers lost confidence in the market and waited for prices to drop further. Then, some books weren’t being restocked due to disputes with publishers (who have lost buckets of money on this); then lease breaches. Even making customers pay for plastic bags, didn’t help. The equity group failed to realise that you can’t expect infinite growth without putting something in to maintain growth. And they underestimated the impact of online buying and ebooks. It was a disaster in slow motion. Anyone in book sales now needs to differentiate on passion or price. Unfortunately, Borders under Red Group had neither.